Double tracking is a recording technique that gives the listener the impression that particular voices or instruments in a mix are doubled or playing in unison. It was popularised by the Beatles when they recorded at Abbey Road – mostly at the behest of John (who said he hated the sound of his voice). The technology involved with this process has changed drastically over the years making it easier to replicate the effect. Double tracking was a revolutionary technique that has developed to become a stable of vocal recording. Let’s take a look at some modern techniques. Originally, the process of double tracking required the artist to record onto a track of an analog tape, then overdub on another track on the tape. These days, using digital audio workstations (such as Logic, Reason or Pro Tools) in the recording studio, or loop pedals when performing live, can create the same effect. When recording using a DAW it is relatively simple to produce a quality track using this technique. You can record to create the first track, then either overdub on a new track, or duplicate the original recording onto a new track. The overall effect will make the doubled track stand out in the mix. 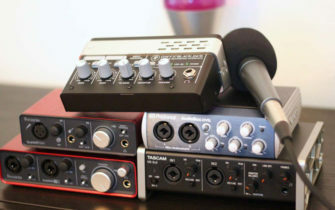 If you decide to overdub each track instead of duplicating, it’s important to make sure that you record the overdub in the same environment as original track (especially when recording vocals, backing vocals and harmonies) to ensure that the equipment positioning is consistent across the multiple overdubs. This is so the artist can keep generating the same sort of ambience on each track. You can also experiment with the tone by changing the octave and adding different effects to each track. Adding different effects to each part can help add depth to your vocal track and create a pleasant contrast for the listener. You don’t have to stop at just adding one layer or double tracking only one instrument in your song. It’s common to double track more than one instrument or insert more than one layer to a part to enhance and add punch to productions. Another way to produce a double tracking effect is to use a loop pedal. Loop pedals work really well if you want replicate the effect when performing live. When using a loop pedal you are basically overdubbing and adding more layers to an existing loop. If you use the multiply feature on a loop pedal you can record new loops that crossover the original. This means you can easily double track the existing part and instantly record harmonies and melodies over the top in real time. The best thing about the digital approach – by either using a DAW or a loop pedal – is the speed at which you can set up double tracks and thus maintain spontaneity in the performance. This is more of challenge when using the analog tape recorder method. Both formats have their essential advantages, but the underlying principle is the same. If you are hoping to enhance the texture of your song, or elevate a certain part of the mix, a double tracking experiment is well worth it.